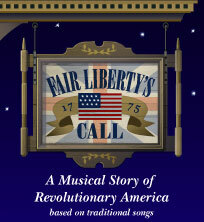 The musical score for Fair Liberty's Call is based on existing traditional songs and instrumental music. As is described elsewhere on the site in more detail, Pamela Meadows, the creator of Fair Liberty's Call, was inspired by music of the period to conceive of telling a story of the founding of America using music of the time to tell it. When Pam first approached me about the project, she had already assembled a group of pieces for the show. Either certain lyrics addressed a specific plot point, or a melody struck an emotional chord so strongly that it would help her shape her story. The range of material she had assembled covered an extremely wide selection of musical styles, from lovely ballads to rousing drinking songs, from patriotic anthems to hymns and spirituals. The sources of the music also varied wildly, from printed 'music of the colonial period' anthologies to 'oral history' recordings of melodies passed down for generations. Some songs are still well-known today because they are truly beautiful, others are only known to historians or re-enactors. There were many challenges to making this collection of music work as a musical, to turn a concert into a show. The biggest challenge was to take these pieces from such varied sources and set them musically in such a way that you could believe that they would belong in one show together. I dealt with this in a number of ways. The traditional melodies of some songs were rhythmically awkward. Certain phrases were 'smoothed out' so they would not be jarring to contemporary ears not totally familiar with traditional styles. Pam did the same type of thing to the lyrics while 'fitting' them to the characters whom she wanted to sing the song. Certain songs that are traditionally done at a fast pace were slowed down and sometimes changed from one time signature to another (say from a two-step to a slow waltz) to properly fit the dramatic point in the show where the song needed to be. In addition, duets, trios and other vocal combinations, right up to full cast ensemble numbers needed to be crafted from the basic material. I wrote vocal arrangements and alternate harmonies for the pieces based on what roles were involved. Even such basic decisions as what key a song should be sung in needed to be made to match the music to the character and therefore to the type of voice which would sing a song. Instrumentals were combined and arranged as dance sequences and underscores. I needed to create introductions, endings, linking phrases and such, all the bits and pieces of material that would convert a selection of nice tunes into a score of a musical theatre piece. One which would honor the origins of each piece while simultaneously incorporating it into a consistent whole which supports the telling of the story. The final piece of the puzzle was the makeup of the instrumental group which would accompany the show. We wanted to preserve the sound and charm of traditional music ensembles. Yet the variety of musical numbers required enough instrumental colors to be able to build up a full enough group sound to hold its own in the large-scale full cast sequences. The choice of the string trio (violin, viola, cello) with a flute/piccolo/Irish whistle doubler supported by a piano gave me enough variety to do that. These are instruments that, in one form or another, would have existed in the period of the story. The violin and Irish whistle especially gave us the traditional sound. The three strings gave me enough voices to sound like a section. Layered appropriately with the piano, using every trick in my orchestrator's arsenal, the group could sound as 'small' or as 'large' as needed. And together with up to 6-part vocal arrangements the show does sound full and lush. I am extremely proud of the musical work I've done on Fair Liberty's Call. It's been a challenge, but one which I've enjoyed taking on. And after listening to the CD I think you will agree it has been worth the effort.